The price drop seems to be the result of a perfect storm of factors, both on the supply and demand side. On the supply side, U.S. production has risen to the point where only Saudi Arabia extracts more oil from its soil. In the recent past, America’s additional production was offset by sharp declines in production caused by the civil war in Libya, plus production declines in Iraq, Nigeria and the Sudan. Those countries are now back in business, adding the production equivalent of 3 million barrels a day, a significant fraction of the 75 million barrels a day of global production. Losers? You can expect the major oil companies to report lower profits in the months ahead, and the Russian economy which is heavily dependent on energy exports and already feeling the impact of an impending recession, is being crushed. Surprisingly, some believe the biggest loser is Iran, whose social program spending and high costs of extraction imply a break-even well above today’s prices, estimated as high as $130 a barrel. As mentioned earlier, oil prices could—and probably will—drop further. But don’t believe the predictions that have popped up in the newspapers and on the financial TV stations of a new era of oil abundance. 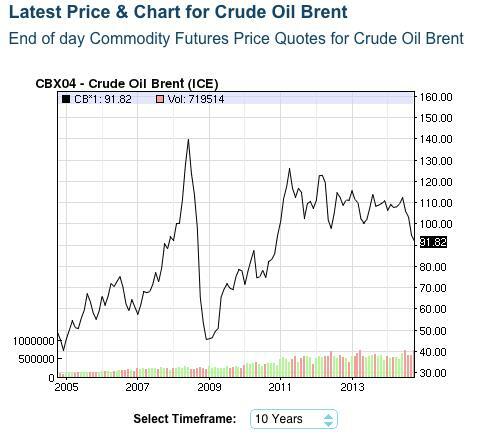 Oil prices almost certainly won’t fall to pre-2007 prices, which can be seen on the accompanying chart. Why? According to the International Energy Agency, the capital cost of producing a unit of energy—that is, the cost of finding oil and gas, drilling for it (and hiring the people who will do these things, who are some of the best-paid workers in the world), moving it from the well to the refinery and refining it have doubled since 2000, and the rise in these costs increases yearly. If oil prices drop much further, shale oil producers in North Dakota and Texas will find it unprofitable to keep drilling. Another floor under prices is the OPEC cartel, which together supplies about 40 percent of the world’s oil. A Bloomberg report noted that OPEC nations—particularly Saudi Arabia—have been surprisingly relaxed about the supply/demand shifts. The cartel nations pumped 30.97 million barrels a day in October, exceeding their collective output target of 30 million barrels for a fifth straight month. However, if oil prices were to dip closer to $80 a barrel, the cartel could well turn down the spigot and change the equation back in favor of higher prices. An OPEC meeting scheduled on Thanksgiving Day should have market moving implications for oil prices. What should you do about all this? Enjoy it! When was the last time you saw prices fall dramatically on an item that you use every day, and that you could hardly function without? Chances are you’ve been whacked by higher gas prices a few times in your life; this is your chance to enjoy a different dynamic—while it lasts. If you would like to discuss any financial planning matters, please don’t hesitate to contact us or visit our website at http://www.ydfs.com. We are a fee-only fiduciary financial planning firm that always puts your interests first. « I’m Self-Employed. How Can I Get Health Insurance?